Coming from the heartland of the USA, the city renowned for its stock yards and steaks, I’m no stranger to a thick slab of meat. Even as a professed vegetable lover, the aroma of chargrilled transports me back to Chicago where my father would serve up enormous grilled potatoes slathered in butter, a crisp garden fresh salad and, of course, the ubiquitous raw steak dripping in blood. It’s my heritage, part of my DNA, but nothing quite prepared me for the Portuguese Minhota Ox. Once a year, Vinum, the restaurant of Graham’s Port Lodge, operated by the Basque group Sagardi, hosts the “Jornadas do Boi de Trás-os Montes,” featuring two meticulously selected oxen by Imanol Jaca, a renowned meat supplier. The concept was developed in 2013 as a means to highlight the best cuisine from the North of Portugal; but this year included two gorgeous farm raised Minhota oxen! Native to the lush, green northern pastures of the Minho, Minhota cattle can also be found in Trás-os-Montes, as well as the Spanish region of Galicia, where it’s known as the Gallega or Rubia Gallega. With its thick, muscular hind legs and long, intimidating horns, this is not a beast you’d want to encounter on a deserted pasture late at night. Weighing in at 1200 kilos, I can safely say that you’d lose the battle. Fortunately, 82 year old rancher, Armindo Oliveira, took it upon himself to raise these 7 and 9 year old oxens exclusively off the land with only natural feed. After slaughtering, the meat dry ages for approximately 20 days before being flash grilled and lightly seasoned with salt. 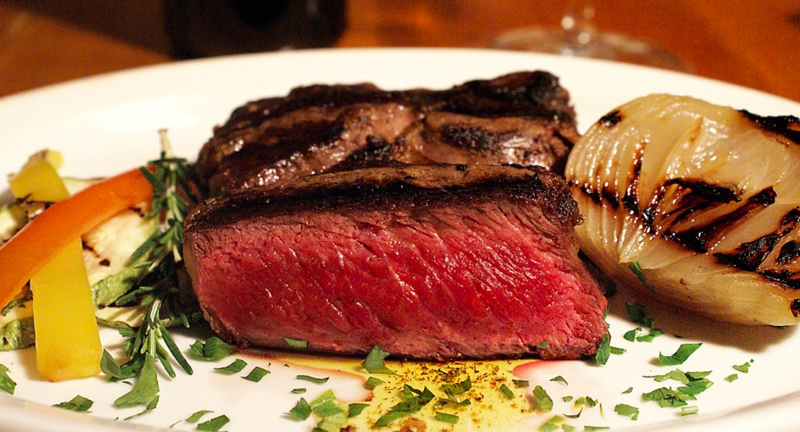 The end result…some of the most herbaceous, flavorful and succulent charred meat I’ve ever had the pleasure of tasting. It may have been “old”, but hot damn, it was delicious! Now maybe you may be thinking, Lady, my cat is about 8 years old and is far from old! Aren’t you being a bit hyperbolic? It’s a fair question, but if you consider that the average age of your store bought steak is approximately a year old, these oxen are ancient. This is a romantic endeavor for Armindo, a craft of love, not money. The amount of grass, oats and straw he needs to feed these mini dinosaurs over a half decade is monumental and far from economically viable. It’s an act of passion, that provided us with a very rare gastronomic experience. Other highlights from the Festival included the “Feijão branco com bacalhau e amêjoas” (white beans with salted cod and clams) paired with the 2012 Quinta do Vesuvio. For those of you not familiar with Quinta do Vesuvio, get to know it! Quinta do Vesuvio is one of the great Quintas of the Douro and owned by the family Symington since 1989. Located in the Douro Superior (the warmer, drier section, up river from Pinhão), 120 km east of Porto, they’ve gained an international reputation for their single-quinta Port wines, but their still wines are equally exceptional. The 2012 – made with Touriga Nacional, Touriga Franca, Tinta Amarela – could easily make your holiday menu. Pairs well with fowl, enhances red meat and could easily be enjoyed fireside simply on its own. This is wine to age if you have the patience. 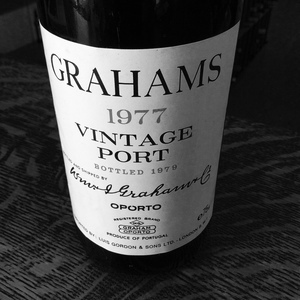 The meal lasted for 5 courses, and 4 wines, but the dessert wine was a rare treat: Graham’s Vintage 1977 Port. On this particular occasion, it was paired with a host of traditional cheeses, as well as their hot chocolate mousse (admittedly, not my favorite dessert of the North), but could easily hold up to any number of sweets. With aromas of licorice, plums and dried fig, followed unctuous spice and mulled fruit aromas, it’s a lovely wine to sip into the wee hours. For those of you interested in savoring a succulent old draft ox (you’ll have to trust us on this one! ), book your trip to Porto around this time every year, because Vinum just might feature it on their menu around the end of November through the beginning of December. If not organically grown ox, you’ll surely find another gastronomic treat from the North worthy of tasting. Huge thanks to both Graham’s and Sagardi for inviting us to this stunning meal, and we look forward to more surprises coming out of their kitchen in the near future! Stay tuned for a full feature article on Portuguese beef!! !